Toshiba Satellite C55T-B5354 (PSCLYU-016001) is a powerful mid-range computer with a responsive 15.6 inch touch display to navigate Windows 8 functions easily, the fast processing power of the Haswell i5 processor and the smooth multitasking by 8GB memory as it is designed for day-to-day computing as a great value full size and portable, solid performer. It is suitable for everyday and moderately demanding applications, business and schoolwork and home entertainment including movie streaming and casual gaming at a reasonable price. Toshiba Satellite includes the dual core ultra low voltage Intel Core i5-4210U processor with 1.7GHz to 2.7 GHz speed with turbo boost and hyper threading with 4 threads in parallel to enhance the processor efficiency and 8 GB DDR3 SDRAM at 1600MHz so all programs will run smoothly and simultaneously (max memory supported is 8GB on this PC but it is already plenty for advanced multitasking), 1 TB SATA HDD at 5400 rpm spindle speed which is relatively slow but lets you save a great number of files and Windows 8.1 operating system which benefits from this Toshiba’s touch display and you’ll get a free upgrade to the Windows 10 which is expected to be released in 2015. 15.6 inch diagonal glossy LED-backlit HD TruBrite touchscreen with a maximum of 1366×768 resolution supporting 720p content and 16:9 widescreen cinematic aspect ratio does not offer outstanding picture quality as it is not FHD and viewing angles are not the best due to not having IPS panel but it should be satisfactory overall unless one has high expectations and the presence of touch function lets you make better use of Windows 8 features. Intel HD 4400 is fine for occasional gaming and you won’t have any problems with playing games like Minecraft smoothly or any of the other older titles for that matter but with the newer ones like Battlefield you can only play some of them and at low settings and resolutions and no problems with watching high definition content. You have the HD webcam and built-in microphone for formal and informal live chats with people you care and for work purposes. Simple yet slim attractive design with clean lines and a black matte finish- textured resin in jet black Toshiba Satellite has a weight of 4.8 pounds and dimensions of 10.20 x 14.96 x 1.05 inches so it is rather lightweight despite having a 15.6 inch touchscreen and slender despite looking a little bulky from the sides. Keyboard is not backlit but keys are nicely spaced out and comfy to type on and it is nice to have a separate 10-key numeric pad as well as a responsive trackpad with left and right click buttons. There is no info on battery life but considering the features and specs you should be able to get 5 to 6 hours on a single charge from its 4-cell 45Wh lithium ion battery. Bluetooth is not supported by default according to Toshiba website and other connectivity options include 802.11bgn wireless, 10/100Mbps Ethernet with RJ-45 connector, DVD SuperMulti drive supporting 11 formats, 2 x USB 2.0 ports, 1 x faster USB 3.0 port, an HDMI port, a VGA (RGB) port, SD/SDHC/SDXC/MMC Media Card Reader, Headphone jack (stereo) and Security Cable Lock Slot. Conclusion: Toshiba Satellite C55T-B5354 is one of the most recent mid range notebook released by Toshiba at a reasonable price so it is more than for just basic things and is capable of handling most of the demanding tasks with ease- pretty much anything other than the latest games. You’ll see the usual junkware that comes pre-installed when you first turn it on and you want to get rid of those you will not need, starting with the 30 day trial version of Norton Anti-Virus and replacing with a free AVG online. We like that this is a touch display computer (but not Full HD) with a powerful Intel i5 processor, 8GB RAM and a very large 1TB hard drive (a Solid State Drive would be nice to be able to improve the overall speed and boot-up times but it would also mean sacrificing on the large storage space). Windows 8 is often an eye sore since its release after Windows 7 even though the 8.1 version is better and soon you will be able to upgrade it to most probably the better operating system Windows 10. 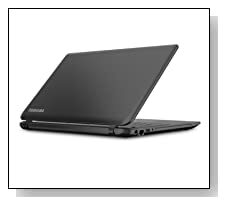 With the ultra low processor and power efficient design it is an Energy Star qualified and EPEAT Gold registered computer and is offered with 1 year standard limited warranty by Toshiba. 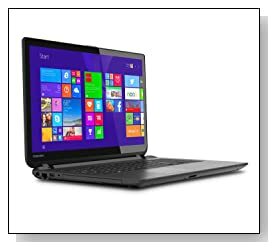 It is a great mid-range computer with decent specs and features that we recommend as it seems to offer great value for dollar, judging by technical info and expert and customer reviews.